Our dedicated graphics card test system is packed with some of the fastest complementary components available, to put any potential performance bottlenecks squarely on the GPU. Most of the hardware was provided by the manufacturers, but we purchased the cooler and storage ourselves. To see how the $700 Radeon VII stacks up against the current competition, we’re comparing it to Nvidia’s $500 GeForce RTX 2070, $800 GeForce RTX 2080, and $1,200 GeForce RTX 2080 Ti Founders Edition graphics cards. We’re also including benchmarks for the $740 PNY GeForce GTX 1080 Ti and AMD’s $500 Radeon RX Vega 64 reference card. Each game is tested using its in-game benchmark at the highest possible graphics presets. We disable VSync, frame rate caps, and all GPU vendor-specific technologies—like AMD TressFX, Nvidia GameWorks options, and FreeSync/G-Sync, and we enable temporal anti-aliasing (TAA) to push these high-end cards to their limits. If any setting differs from that, we’ll mention it. Let’s kick things off with Strange Brigade ($50 on Humble), a cooperative third-person shooter where a team of adventurers blasts through hordes of mythological enemies. It’s a technological showcase, built around the next-gen Vulkan and DirectX 12 technologies and infused with features like HDR support and the ability to toggle asynchronous compute on and off. It uses Rebellion’s custom Azure engine. We test with async compute off. Editor’s note: The graph below is labeled incorrectly. The blue line indicates 4K performance, the red line is 1440p performance, and green is indeed 1080p. 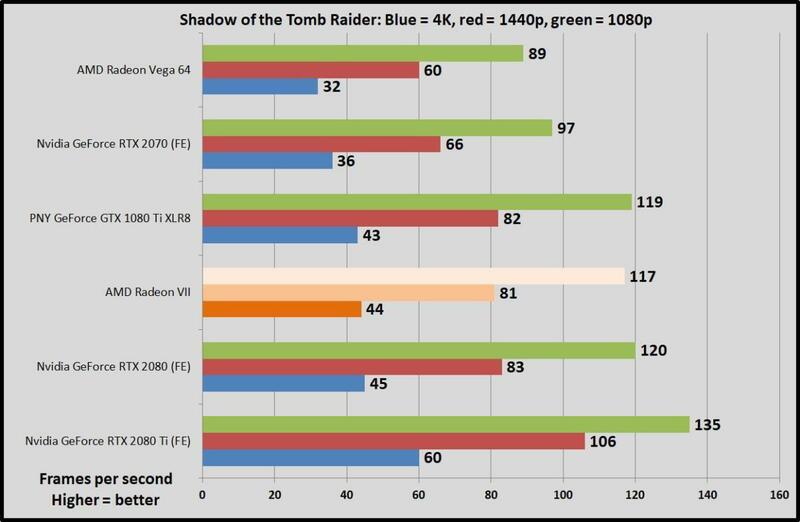 Spoiler alert: Radeon VII puts in its strongest performance by far here, easily outclassing both the PNY GTX 1080 Ti and the Nvidia RTX 2080 FE—two similarly priced graphics cards—by more than 10 frames per second across all resolutions, and toppling the older Radeon RX Vega 64 by over 40 percent at 4K resolution. Shadow of the Tomb Raider ($60 on Humble) concludes the reboot trilogy, and it’s utterly gorgeous—even the state-of-the-art GeForce RTX 2080 Ti barely manages to average 60 fps with all the bells and whistles turned on at 4K resolution. Square Enix optimized this game for DX12, and recommends DX11 only if you’re using older hardware or Windows 7, so we test with that. Shadow of the Tomb Raider uses an enhanced version of the Foundation engine that also powered Rise of the Tomb Raider. The three $700 graphics cards turn in virtually identical performances, including the Radeon VII. Again, the newer card outclasses Vega 64 by just shy of 40 percent. Finally, a DirectX 11 game! Far Cry 5 ($60 on Humble) is powered by Ubisoft’s long-established Dunia engine. It’s just as gorgeous as its predecessors were, and even more fun. Radeon VII once again manages to hang tough with Nvidia’s powerful pair of $700 GPUs, flirting with 60 frames per second even with everything cranked at 4K resolution. 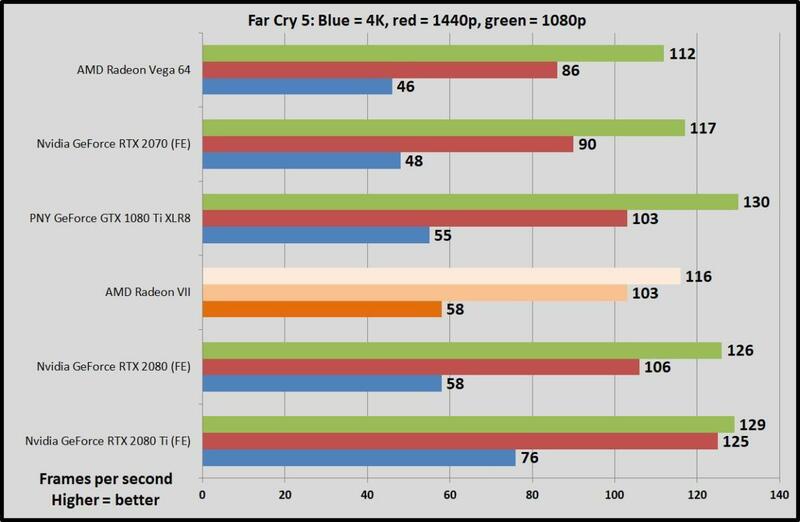 Its lead over Vega 64 greatly diminishes in this game though, at just over 26 percent faster.